I thought I was prepared for This Is Where It Ends, considering I’d been looking forward to reading it for months prior to reading it. Spoiler: I was not prepared in the slightest. 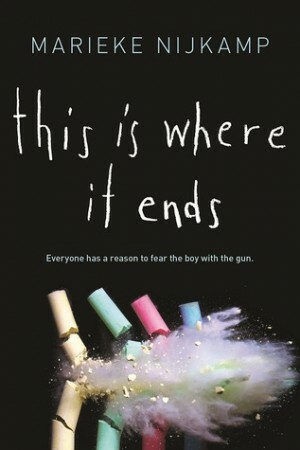 This Is Where It Ends is a truly harrowing story of a fictional school shooting. It follows four students who are caught up in the shooting in different ways. They’re all connected to the shooter in some way, and we watch as their entire world starts to fall apart. I struggled a bit with the four points of view to begin with, as I thought that Sylv and Autumn’s voices sounded incredibly similar, and Claire wasn’t very standout. Tomás, however, was someone I loved from the beginning. I have a soft spot for cheeky pranksters, okay? But anyway, once I got past the first fifty pages or so, I got to know the characters a bit better and I was able to connect with them more easily. And from then on I was hooked. Everything about this book was amazing, apart from two minor points. The first thing I would like to point out is the romance. I’m wondering if an editor somewhere along the way made the author throw some romance in to “keep the book YA”, because there are two different instances where the romance was either awkward, out of place, or completely ridiculous. I didn’t like the romance between Claire and Chris. I didn’t think it was necessary at all. And then Tomás worries about impressing his crush in the midst of the shooting. Like… really?! Now is NOT the time. But I adored the other relationships. Autumn and Sylv stole my heart (they’re girls and they’re together), and Tomás and Sylv’s relationship absolutely broke me. The latter was my favourite part of the book because I have siblings that I would do just about anything for to keep them safe, so I felt a huge connection to Tomás. HEART EYES. Another thing I really struggled with while reading This Is Where It Ends was the depiction of domestic abuse. I struggle with this at the best of times, but while reading those parts I was pulled out of the story. I can’t tell exactly what the reason for that was, but it happened. Overall, This Is Where It Ends is, like I said in the beginning, a truly harrowing story. I wouldn’t call it exciting. I would call it disturbing and upsetting and diverse. Definitely pick this one up if you get the chance, but be prepared for graphic descriptions, and an ending that will damn near break you. I am glad to see that you liked this one! I found it to be impossible to put down. I just wanted to know what was going to happen. It was extremely scary at times as well. It was so thrilling and terrifying!